The half century, the big five-O, the fiftieth. Whatever you prefer to call it, this is one of the biggest birthdays you’ll ever have. Such a milestone deserves a celebration that places maximum emphasis on fun. At Harbour Kitchen, we offer the most complete 50th birthday party venue in Melbourne and we’ve also got a couple of ideas to make the big day that much more special.Окна недалекого будущего. If you’re turning 50 it means you’ve seen a few decades. One of the defining aspects of the past few decades has been the fashion trends. Consider choosing your favourite (or least favourite) fashion decade and make it a party theme. Invoke the free-loving, rebellious spirit of the 70s, release the wildest 80s outfits from the depths of your wardrobe, or drag out the daggiest 90s items you can muster. Make sure you bring a few embarrassing photos of the birthday celebrant from the era in question to accompany the outfits. The good news is that all these decades are great for a dress up event and you’ll at least look a little better in the beautiful surrounds of your Harbour Kitchen birthday party venue. If the fashion of previous years is a little too embarrassing, you might still want to consider a gentler trip down memory lane. A 50th birthday is a great time to bring out old photos. One from every year if possible, but certainly as big a selection as possible. You might want to string them up in chronological order so guests can see how the birthday boy or girl has progressed over the previous 49 years. Combine this with a memory jar, in which guests can leave written notes or mementos that they share with the celebrant, and you have a recipe for a great event. Whether it’s for you, your friend or a loved one, after five fabulous decades, a 50th birthday deserves to be a day or night to remember. 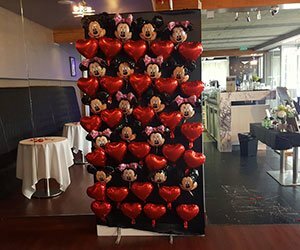 Selecting a fun theme will go a long way to making that happen, as will a birthday party venue that does all those years justice. And Harbour Kitchen is just such a venue.